By taking the guesswork out of employee learning, top Silicon Valley companies create new learning initiatives to drive higher employee engagement. In their guide Create an employee-to-employee learning program, Google offers tips on how to make learning a part of a company’s culture. The company “warns” that organizations “looking to save money on a training budget and mandating participation, could end up with resentful employee teachers delivering rushed classes to confused employee learners.” Therefore, considering the potential pitfalls should be a priority. At Google, 80% of all tracked trainings are run through an employee-to-employee network called “g2g” (Googler-to-Googler). The “g2g” learning program is created to offer first-hand knowledge in different fields, from employees to employees. What makes the program so successful? Summed up in one sentence, it promotes a culture that values learning. First, Google acknowledges the employees’ right to learn. Second, it gives them an opportunity to grow with an on-the-job-training and allows them to give back to other employees by participating in the program. So, even if the program is of a “voluntary nature,” employees care for the value it provides both to them and the organization as a whole, and support its nurturing power. According to Google, “your own employees are perhaps the most qualified instructors available to you.” The role of the managers in establishing a “healthy team culture” for group employee learning is immense. 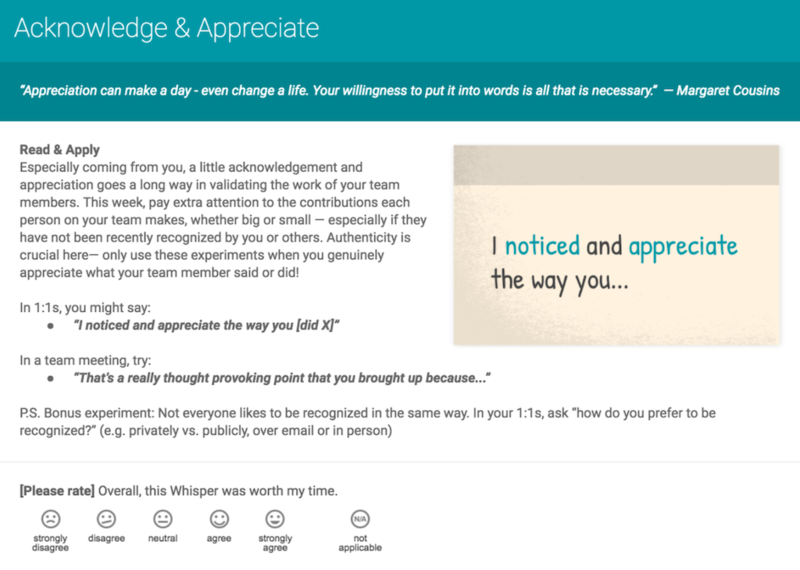 The microlearning method was used to remind managers “of the importance of regularly showing genuine and explicit appreciation for their team members.” A survey showed that because of its positive effect, 95% of the participants would recommend the whisper course to fellow Googlers. Nudges are, “simple interventions that change behavior in a predictable way.” Based on behavioral economics, which studies why people sometimes make decisions against what seems rational or logical, nudges can improve work experience in organizations. But only if they are transparent and don’t limit choice. Carol Dweck, a psychology professor at Stanford University, has spent years researching how having a ‘growth mindset’ impacts students’ academic performance. Her impactful work influenced many people, including a 13-year old student who put “prof. Dweck’s findings into practice” and “experienced great improvement” in those areas of his life. So, when Satya Nadella became the boss of Microsoft in 2014, he expanded on prof. Dweck’s impressive work based on solid research. The goal was to encourage employees to embrace a change in their mindset and believe that if they are eager to learn, their skills will improve over time. Prof. Dweck’s studies show a clear difference in achievements between students with a fixed vs. students with a growth mindset. Through the years, she discovered that the school system that praises talent and intelligence has failed because it makes students run from difficulty. In one of her studies, scientists measured the electrical activity from the brain as students confronted an error. The brains of fixed-mindset students showed hardly any activity because they run from the error. On the other hand, the brains of growth-mindset students showed substantial activity because they engaged deeply and processed the error. Facebook's approach to L&D is multidimensional. With an objective to “promote respect and foster a culture of continual learning,” Facebook’s learning culture is designed to provide employees with personalized experiences for individual learning. Their most recognized program, Managing Unconscious Bias, is based on the “belief that understanding and managing unconscious bias can help employees build stronger, more diverse and inclusive organizations.” The goal of the program is to train employees to acknowledge workplace bias and reduce its negative effects. Daniel Kahneman, the Nobel prize-winning psychologist, introduced the notion of cognitive biases, together with Amos Tversky. Their theory is based on the explanation that human judgments and decisions tend to differ from rational choice theory, that is based on the premise that the social behavior results from the behavior of individual actors. The rational choice theory assumes that people make their personal decisions based on preferences among available choice alternatives. According to Kahneman’s theory that shattered the way we think about decision-making, human judgment and decision-making involve mental shortcuts that help us deal with large amounts of information, quickly. Because of these mental shortcuts, called heuristics, we make rational decisions without much effort, which leads to decision-making biases. Both Facebook and Google, use the potential of applying behavioral economics to help people value an idea and encourage them to make better choices, which leads to better organizations. The company’s signature training “Bootcamp” is a six-week introduction to the website’s code base, mandatory for all Facebook engineers. The program has been a success in maintaining the culture of the engineering team throughout Facebook’s growth. “Bootcamp” allows engineers to determine how they want to contribute to the company and it gives old and new employees an internal network that creates unity. Managers have their own program called Facebook’s Engage Coaching Program that merges new managers with an executive coach. Using one-on-one sessions, the coach helps the new manager develop effective people management skills. An overlooked learning program, Facebook's FLiP (Facebook Leadership in Practice) is a peer-to-peer program where leaders receive feedback and coaching from their peers and executives. The coaching program offers great insights into leadership best practices, case studies, and team building exercises. Amy Hayes, Global Head of L&D at Facebook shares the company’s vital practices to deliver just-in-time learning. Employees enroll in online communities using Facebook Workplace which connects employees that have something to teach with employees eager to learn. Launched just last year, Amazon’s training program called ‘Pivot’ raised lots of questions in the business world and the media. The goal of the program is to give guidance and support to underperforming employees by pairing them with a “subject matter experts” called Career Ambassadors. The company launched the program as a part of their performance improvement plan, also known as “PIP.” The program is designed to track employees on their path to reaching their goals and put pressure on those that are failing. With their “annual stacked-ranking,” the company pulls out the lowest-rated employees before putting them on PIP. According to Amazon’s HR managers, Pivot is the company’s way of “coaching and enforcing changes in behavior, a “necessity” that ensures better work performance. However, in the eyes of the employees, being a part of this program can be perceived as a warning before getting fired. Kristen Swanson is a director of learning at Slack, a messaging app that aims to eliminate the need for e-mail. Inspired by the children books Choose Your Own Adventure, Swanson developed a training method called Slack Certification. The training includes a series of interactive scenarios where the user selects a character, gets information on the fictional character’s role and job duties, and by using the Slack app, interacts with a chatbot to perform a task. Swanson says the app gives people “an opportunity to make bad choices and see what happens, or make good choices and see what happens.” This is not the first time for Swanson to use the power of play as an educator. She has been particularly interested in the approach of “understanding by design.” The approach focuses on “beginning with the end in mind,” starting backwards from the main learning point and planning the teaching to get there. Early in her career as a third-grade teacher, Swanson had her students involved in the process of creating games using Microsoft PowerPoint. “One of the students in the class who was working so hard on this project, and later she saw one of the other kids playing the game they created. What I saw on her face was, ‘Wow I have created something that has made an experience happen for someone else.’ It became this kid’s superpower.” “That made me realize this idea of intentional design and immersing people in experiences could unlock this whole new future,” Swanson says. One of her visions for professional learning at Slack includes the possibility for people to ‘pull what they need’ from integration between Slack and Bridge, their learning management system. It takes the focus from ‘pushing’ lots of mandatory content and transforms it into the concept of “brief, targeted, and modular learning experience,” she explains. These companies accentuate the importance of a great learning culture and show growing efforts of workplace personalization. What are your experiences with the learning culture in your organization?